Sixty-six houses line Broadway between Garth Avenue and West Boulevard, each with a storied history and inimitable appearance. Built before the days of cookie-cutter neighborhoods and suburban sprawl, these homes have personality; their leaded glass windows wink, their stately porches welcome, their original hitching posts beckon “stay a while.” Many of them have been recognized by the Columbia Historic Preservation Commission, including 610 W. Broadway, a grand brick estate on the southeast corner of the Glenwood Avenue intersection. The Keevinses have gone to great lengths to make sure every aspect of the home is authentic — architecturally, and in its décor. From Mike’s tuck-pointing and carefully selected light fixtures to Jewel’s Stickley-period furnishings, the house transports visitors back in time. In some respects, the house is as modern as it is venerable. The kitchen — while embracing the historic ambience — is up-to-date with the latest professional-grade appliances (a six-burner gas cooktop, double wall ovens, a warming drawer and a wine fridge), dark-veined granite countertops and a cork floor. Below ground, an entertainment room boasts a high-definition projector and 120-inch movie screen. Keevins added a sump pump, along with drain tile and waterproofing, to keep the basement dry. 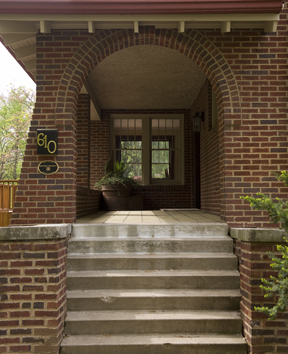 Seven steps lead under a brick archway and onto a portico on the east side of the house. 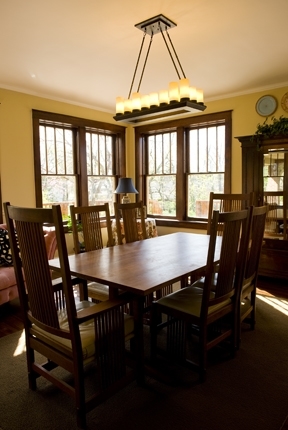 Henry Rollo Mueller, who owned the house from 1939 to 1980, enclosed the porch with storm windows to create a sunroom. His daughter, Marciele, now 86 and a Pierpont resident, remembers a glider and Adirondack chairs on the porch during the 10 years she lived there (1939 to 1949). Keevins removed the storm windows. “They were so dated,” he says. “They aesthetically took away from the natural historic qualities of the home.” Now the reception way is open to the elements — including warm morning sunshine and soft afternoon breezes. In the 1940s, this room was home to one of Columbia’s first color televisions — an RCA TV that belonged to the Muellers. The family also had a radio and a piano in the living room. Marciele Mueller’s courtship with her future husband, Ralph Maledy, occurred here. Opposite the living room is the dining room, separated from the main hall via French doors. Nine large windows on three walls offer views of the grassy yard, including a large oak tree on the northeast corner of the property — rumored to be one of the oldest trees in town. The lily of the valley that Marciele remembers thriving in the yard still grows around the front entry steps today. The kitchen, originally a servants’ area, was designed to keep the wait staff out of sight. The butler’s pantry, or breakfast nook, as the Muellers remember it, even housed a dumbwaiter that ran to the original master bedroom above. Keevins expanded the kitchen doorway, making it more accessible and open to the main hall; he also removed the very narrow servants’ staircase that went up to the second floor. The house, of course, was built without a dishwasher. When Floy Mueller moved in, she had a small, circular window installed in the 14-inch-thick wall above the sink. “My mother said she would not wash dishes to a blank wall,” Marciele remembers. 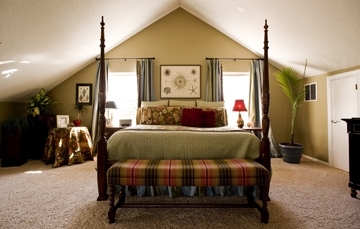 Upstairs, the Keevins’ four children each have a bedroom. The rooms flow, with bathrooms or pocket doors linking them together. With two boys and two girls, there’s also a balance between airplane and rainbow-themed décor. When Marciele married Ralph Maledy on June 24, 1949, she prepared for the ceremony in her childhood bedroom, which now belongs to 5-year-old Lily Keevins. The main staircase at the end of the front hall served as a backdrop for Marciele’s wedding portrait; on the enclosed porch, she posed with her father. The master bedroom covers the entire third floor. The space is large (685 square feet), but the slanted ceiling and low-set windows along the north wall make it feel intimate and cozy. In the 1940s, this bedroom was home to three boys from the University of Missouri who needed housing (due to World War II, student dormitories were full). In the center of the room sat a large pool table, which the original owners installed — through the roof — before the house was completed. “If the boys ran out of money and couldn’t go to Booches, they played pool there,” Marciele says. The basement also contains an entertainment area and lots of storage space. Behind shelves of holiday decorations and out-of-season clothes sits a large safe built into the wall (directly below the porch). Four hand-painted eagle emblems embellish the sturdy metal doors, and although the box is empty today, one can’t help but wonder what treasures it once held. Outside, a newly constructed wood deck seems to cascade off the back of the house. Keevins says he created different areas and levels for tables, lounge chairs and other deck décor. There’s also a small opening where a redbud sapling shoots through the wood flooring. “I can’t cut down a tree,” Keevins says. A. Fredendall, owner of Columbia’s first department store, built the house and lived there until the late 1920s. “This house in unbelievably well-built,” says current owner Mike Keevins. 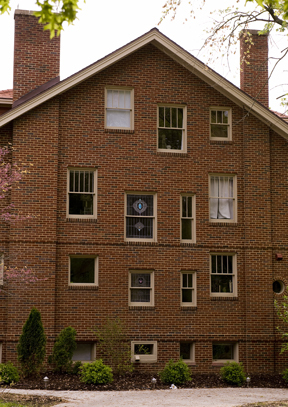 “He had access to many things, so the house was ahead of its time from the start.” Fredendall incorporated a central vacuum, copper pipes, a servants’ buzzer system, and even imported five stained-glass windows from England. Boyd W. Lucas and family, who owned Missouri Store (a forerunner to the successful Missouri Book Store) lived there from 1930 to 1939. H.R. Mueller and family lived on the 900 block of Broadway and moved down the street to 610 in 1939. They stayed the longest of anyone so far, until 1980. Mueller operated H.R. Mueller Florists, located where Kaldi’s coffee is today. Max Gilland was a wholesale jeweler who owned Bermuda Gold — and 610 W. Broadway from 1980 to 2005. After 25 years, the Gillands moved to California, hosting an estate sale before they sold the property. Mike and Jewel Keevins have owned the property since July 2005. Mike, who owns Finding Frog Realty Co., spent 14 months renovating the house before the family moved in this winter (they’d previously lived there before restoration work began). Jewel made her Stickley purchases at Dau Furniture in Ellisville. Many of her antiques were purchased locally from McAdams’ Ltd. and The Market Place. The Keevinses hope to build a home off Rock Quarry Road and have placed the house on the market.